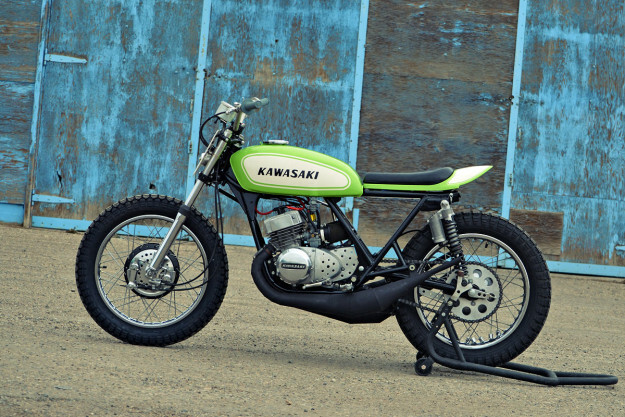 Flat-trackers and two-strokes are some of our favorite things. Combine the two, and we’re hooked. Aaron hails from Lethbridge in Alberta, Canada, where he builds and tests turboprop engines for an aircraft engine manufacturer. 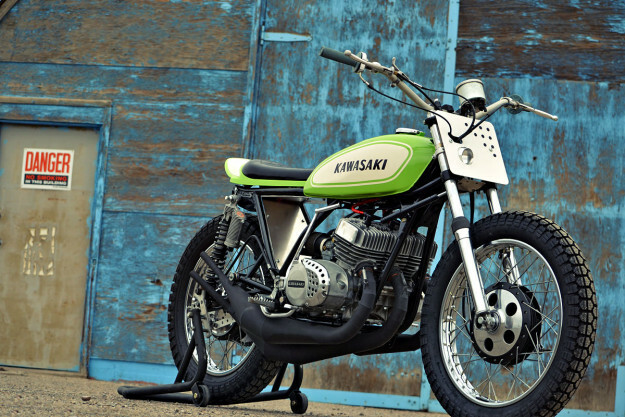 His family used to run a Kawasaki shop, which is where he first came across his S1. The engine was still in excellent shape, but that didn’t stop Aaron from pulling it apart and giving it a thorough inspection. 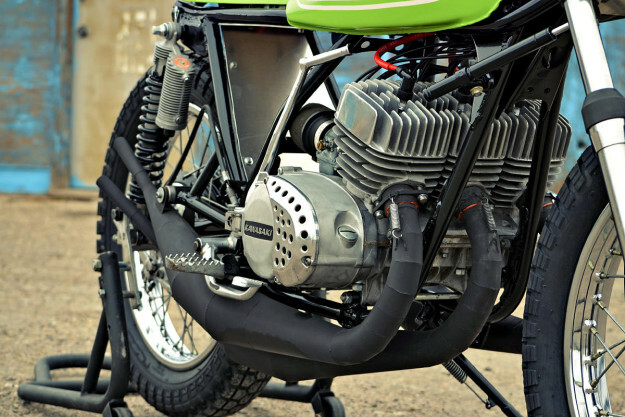 In the process, he shaved the heads a tad to bump up the compression, and overhauled and rejetted the carbs. He gave the frame a solid once-over too—removing tabs that weren’t needed, and adding new ones in the right places. Not wanting to wreck a rare find, Aaron only bent the seat brackets slightly to mount it. 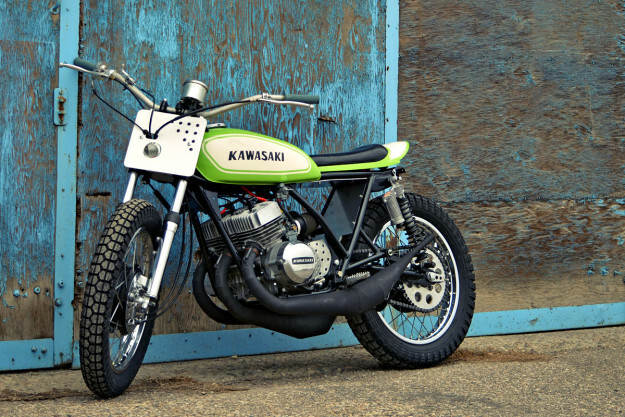 In front is the stock S1 tank; both have been finished in a crisp, classic Kawasaki paint scheme. 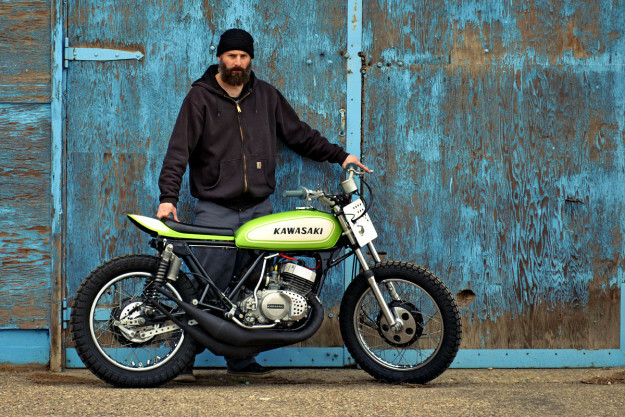 The parts bin additions don’t stop there: Aaron installed 70s Marzocchi shocks from a Hercules GS250, solid aluminum bars from his “parts pile,” and a spare choke lever from a Kawasaki H1R project he’s working on. 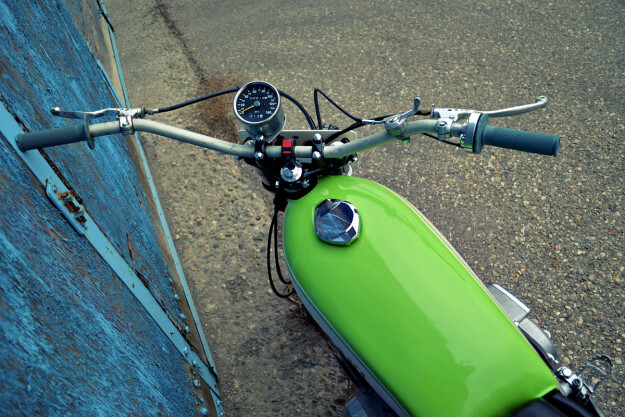 The clutch lever is from Works Connection, and the foot pegs are from his Husqvarna dirt bike. The original wheels were stripped, painted and re-laced, with a new Duro tire fitted up front. 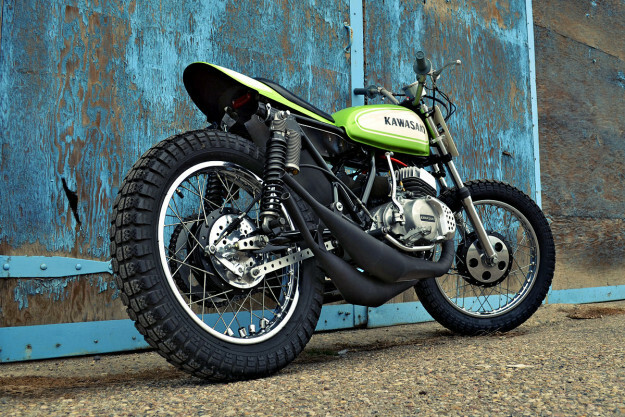 The stock drum brakes were refurbished and drilled, and the original forks rebuilt and retro-fitted with custom-made preload spacers. Aaron also tore into the electrics—building a new, simpler wiring harness from scratch. 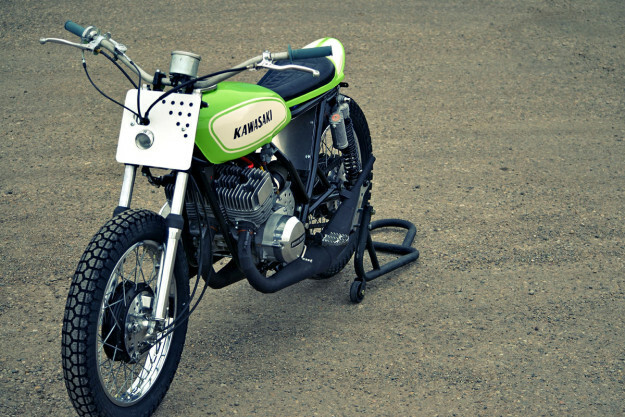 The ignition’s now controlled by a Yamaha WR450 push button, and there’s a modern rectifier and regulator. Under the seat is a small gel battery and there’s a switch on the bars to flip between low, high and strobe for the LED headlight. The running gear’s been kept simple. 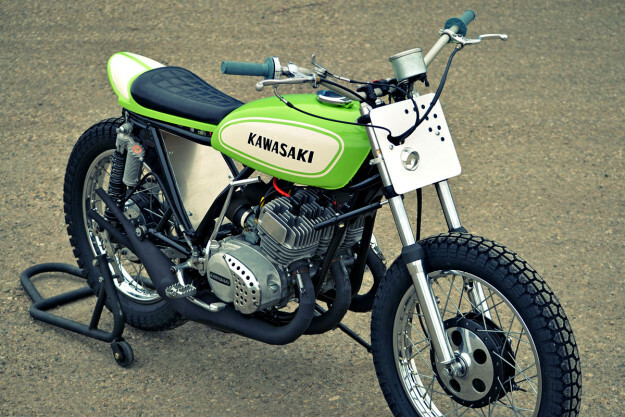 There are no mirrors, turn signals or fenders, keeping it “as true to a race bike as possible.” There is a speedo though: the original S1 unit, minus the factory bezel. And Aaron has added an inner fender out back, in the form of an aluminum block-off plate that doubles up as under-seat storage. There’s a host of other details that would take us hours to list, but the real question is whether all the effort was worth it.